Astronomers have discovered the most distant population of star clusters ever seen, hidden behind one of the nearest such clusters to Earth. At a distance of more than a billion light-years, the newly discovered star clusters provide a unique probe of what similar systems in our own galaxy once looked like. 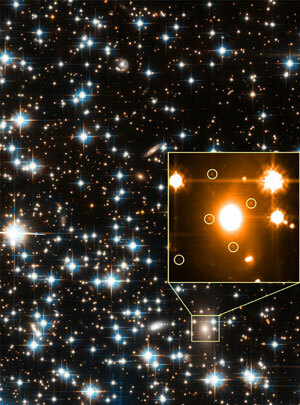 "Given their distance, the light that we see today from these clusters was emitted more than one billion years ago and may hold important clues for understanding the evolution of globular clusters," said Jason Kalirai, a postdoctoral fellow at the University of California, Santa Cruz, who will present the findings in a talk at the American Astronomical Society meeting in Seattle. Kalirai and Harvey Richer of the University of British Columbia led the study, which began as an investigation of a globular star cluster in the Milky Way galaxy known as NGC 6397. The researchers acquired one of the deepest optical images ever taken with the Hubble Space Telescope's Advanced Camera for Surveys, focusing on a small field within NGC 6397. This cluster, home to hundreds of thousands of stars, is 8,500 light-years away, making it one of the closest globular clusters to Earth. The new data from stars within NGC 6397 have yielded important insights into the age, origin, and evolution of this cluster. Hidden in the background, however, were findings that may hold even greater promise for understanding the evolution of such clusters, Kalirai said. Within the population of stars and galaxies behind NGC 6397, the Hubble image revealed a large elliptical galaxy that contains several hundred globular clusters. Although each of these clusters probably contains hundreds of thousands of stars, they are so far away from the Earth that each cluster appears as a single faint point of light in the Hubble image. In fact, a single giant star in NGC 6397 appears 10 million times brighter than one of the distant globular clusters. Nevertheless, the faint light from these clusters could yield valuable information, Kalirai said. Kalirai and Richer followed up the Hubble imaging observations with spectroscopic observations using the Gemini Multi-Object Spectrograph on the Gemini South Telescope on Cerro Pachon in Chile. They were able to determine the distance of the elliptical galaxy hosting the globular clusters by measuring its redshift (a measure of how the expansion of the universe shifts the wavelengths of light from a distant object). This showed that the globular clusters are the most distant ever studied. "The properties that we infer for these clusters may therefore represent an important clue in understanding what our own Milky Way globulars, such as NGC 6397, looked like in the past," Kalirai said. Previous studies by other researchers of globular clusters in nearby galaxies, including the Milky Way, have shown that these systems play a very important role in understanding the formation and evolution of galaxies. With a sample of almost 200 clusters in this one distant galaxy, Kalirai's team will test whether the properties of these globulars are consistent with the idea that elliptical galaxies formed the bulk of their stars at early times. For the first time, the observations may also allow astronomers to test for evolution in the properties of globular clusters themselves, Kalirai said. In addition to Kalirai and Richer, the team involved in this research includes Jay Anderson of Rice University and Jay Strader and Kieran Forde of UC Santa Cruz. This work was supported by NASA through a Hubble Fellowship grant awarded by the Space Telescope Science Institute to Kalirai. Support for this work was also provided by a grant from NASA/STScI, the Natural Sciences and Engineering Research Council of Canada, and the Canada-U.S. Fulbright Program through the award of a Fulbright Fellowship to Richer. Note to reporters: You may contact Kalirai at (831) 459-3804 or jkalirai@ucolick.org and Richer at (604) 822-4134 or richer@astro.ubc.ca.